Want to Join SMR? Here’s How! 3 years of recent alpine mountaineering experience, including technical rock and glacier. It is recommended that applicants have led class 5.6 rock and Grade II ice in an alpine environment. SMR accepts new members twice a year, once in February, and once in August. Check out our application page for more info. Cheri: Being part of SMR has been great. This community of climbers are amazing to work with and very welcoming. They are supportive, patient, and it has not been an intimidating experience getting onboarded. They have a good mentor program in place, which enables one to easily ask questions and learn about how SMR works. Why did you join SMR? C: I chose to join SMR because I felt ready for a new challenge and wanted to use my climbing skills to help people. C: I have done a fair bit of volunteer work in outdoor advocacy and education over the past ten years and felt that it would provide a great platform for furthering my education outdoors. What skills and certifications do you have? C: My role as an educator as well as wanting to be a responsible climber has encouraged me to acquire certifications that refine and enhance my skill set including: AAIRE 1, WFR and self-rescue courses. I have also have spent the last ten years alpine climbing and mountaineering. These experiences along with the education I received made me feel that I was a good candidate to be a member of SMR. How did you learn about SMR? C: I heard about SMR through friends that were already members, and was strongly encouraged to join. I have been on a couple of missions so far, and the most significant skill set that SMR has tapped into of mine is rope work and navigation. Would you encourage others to consider joining SMR? Do you have any advice for people thinking of joining? C: If you are thinking about applying, apply! It’s been an amazing experience thus far and I’m stoked that I made this decision. With your support, Seattle Mountain Rescue will continue to be there for hikers, trail runners, climbers, skiers – anyone who finds themselves in a situation where they need to be rescued. We respond to an average of 100 missions every year, all year, anytime day or night, regardless of weather or terrain. 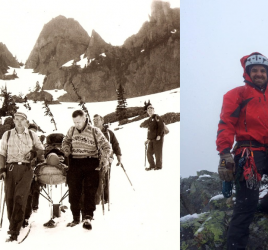 Seattle Mountain Rescue is a non-profit, volunteer run organization. Donations and support from people like you help ensure that we can be ready to assist the community when the need arises. Please consider donating so that we can provide critical support when people need us most.